If you are searching for a Glens Falls editorial photographer then look no further. With my decades of experience as a full time photographer, I am able to handle any sort of photography assignment you may need in the Adirondack region. Throughout my career I have handled photographic assignments for businesses, institutions, healthcare agencies, newspapers, magazines, trade magazines, internal communications, public relations agencies, marketing companies, and many other clients who require a photographer in Albany, NY or the Adirondack mountain region. No baby portraits or wedding photos on this website. I’m a specialist. An experienced one. Why trust your assignment to someone who shows on their website that they photograph kids, babies, senior high school portraits, aerials, weddings, landscapes, fine art … you get the idea. My tens of thousands of news assignments have given me the skill to work with people and to work within your deadlines or other constraints, creating the images you need. And you'll get them on time with no drama and no missed steps. My training is in photojournalism from Syracuse University. My experience is in photojournalism. It's not hyperbole to claim I've covered tens of thousands of assignments. After all my career for many years consisted of working as a full time staff photojournalist. So I’ve handled everything from hard news assignments, such as covering politics, right through to creating feature illustration images. And my location is central to both the entire Adirondack Mountain region and the Capital Region of Albany. I’m also well placed to handle assignments in southern Vermont as well as the Berkshire Mountains and western Massachusetts. Receiving this assignment to work as an Albany photojournalist, I travelled to cover a championship football game. I noticed this unusual and cinematic image during a slow moment of the game. 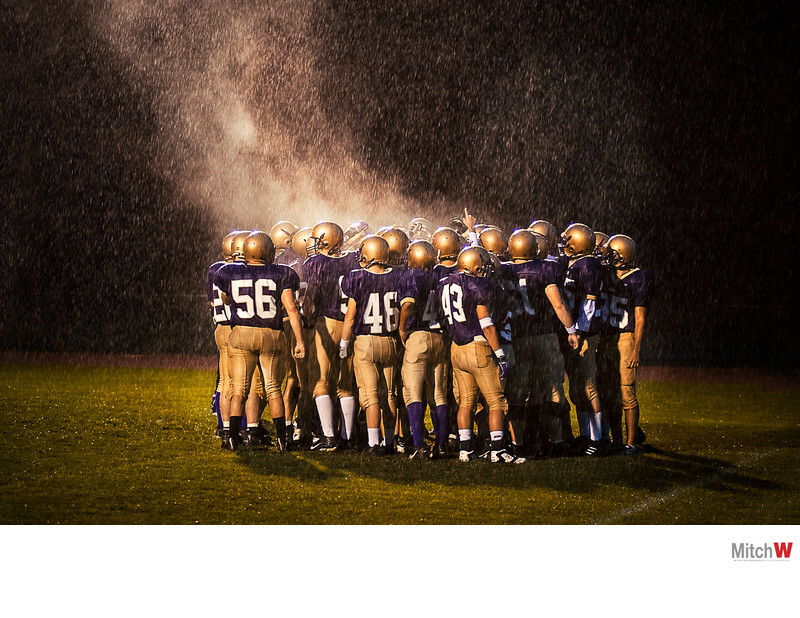 The steam rising from the huddle of football players was a result of the cold and rainy conditions while I was covering the game. It is always my goal to look beyond the obvious image when photographing any situation. I will always make what is called a keeper image as quickly as I possibly can. I will always execute exactly what the client wants thoroughly and completely. But then my goal is to spend the time to look for the special images, the unplanned images, the images that rise up beyond anything that could have been preplanned or expected. And these sorts of moments where dash of serendipity presents itself are my favorite. Being experienced and prepared allows me to capture them when they do happen. And to get them back “home” for you and your publication. Just send me a note via my contact form. It would be great to speak with you about the assignment you have in mind. But I know sometimes there isn’t the luxury of time and a few emails back and forth, today’s equivalent of the “handshake” is all there is time for. We can make it happen! I look forward to speaking with you soon about your next project!